From Mayor Michael Bloomberg and former head of the Sierra Club Carl Pope comes a manifesto on how the benefits of taking action on climate change are concrete, immediate, and immense. Wow, totally supports my paper about biospheres and the need for circular economic solutions to ameliorate climate event impacts. THis was a well written perspective which compliments " Connect" by John Browne and "How to run a government- so that citizens benefit and taxpayers don't go crazy" by Michael Barber. The principle of parsimnoy is a real test for all governments and businesses alike. 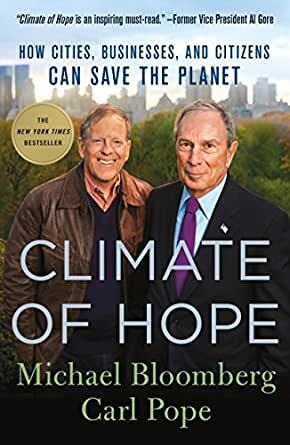 Climate of Hope is a platform for former New York mayor Michael Bloomberg and former head of the Sierra Club Carl Pope to discuss the causes and manners in which we might address climate change. The tone is optimistic — after a review of the causes of global warming and the science behind long-term climate projections, they describe their various successes, including especially the Sierra Club fight to close highly-polluting coal plants in the United States (funded by Bloomberg). The two men then alternate chapters, describing transportation, agriculture, coastal real estate, and other elements of human society challenged by global warming and/or contributing significantly to it. They discuss solutions in each case, especially (in the case of Bloomberg's chapters anyway) solutions that save money or generate profits. Most of the material will likely be familiar to the people likely to read the book, though perhaps not in such detail. I found myself surprised by only one section of the book, about economic abuses by coal companies in the powder river basin (abetted by the federal government). The book drags a little towards the end, and it tends to oversimplify some of the challenges. Even the historical review tends to credit good intentions more than it probably should. Yes, a huge number of coal plants were shuttered, but 90% of the credit should probably go to plummeting energy prices, not 100% to the Sierra Club as Pope would probably like you to believe. The final chapter, with its list of problems remaining to solve, is particularly mystifying. The list includes broad categories like "political failures," "monopolies," and "poorly designed incentives," and saying "all we need to do is solve these problems" is a little like saying "colonizing the asteroid belt will be easy once we develop free energy and develop a way to breathe in a vacuum." Listing huge problems is not the same as solving them. I also wish the book had an index. The book has, I think, two theses: first, that these problems can be solved, and second that city governments are most likely to take the lead. Both points are reassuring and the book is worth reading. 5.0 out of 5 starsThank you Mr. Bloomberg! I do not always agree with former Mayor Bloomberg. However, I respect and agree with many of his viewpoints so I was eager to read this book Everyone knows Bloomberg is (in his own words, no less) an unapologetic capitalist. This is true. He is also a capitalist who wants to see a world that exists for future generations and has a healthier climate. One of the common arguments I hear about combatting climate change is that it "hurts business too much". Mr. Bloomberg is the owner of a multi-billion dollar company, and he is here to explain why that does NOT have to be the case. He also makes a case for why we as a society have a duty to prepare for the worst that could come from climate change as an insurance policy- our earth is worth it. In this book, along with Carl Pope, he explains ways that businesses and cities can do just that, without the federal government. Obviously, it would be better if all levels of government were on board with smart climate policy. This book truly did give me a ray of hope when the top level of government began to fail at even attempting this, so the title is very fitting. Some of the points Mr. Bloomberg addresses are initiatives taken by NYC to help the climate, ways that the market is actually moving toward favoring cleaner energy sources, and discussing how certain government programs unfairly help dirty industries like coal. The writing is easy to understand- I was a biology major in college, but this was written toward a general audience. It made it a very enjoyable read, and I ended the book feeling energized and more aware of ways I could help the climate, understand energy policy, and get involved with changing our system for the better. Again, this is a MUST read. Most excellent inspiration for what our local communities can accomplish from grassroots level up! Love the concept of nonpartisan team work for solving daunting effects of climate change we are suffering with today and heavy burdens upon future generations to come. Getting many of our old and some new start up coal burning plants to shut down around the country huge success! However, a huge disappointment hit me like a ton of dirty coal bricks on page 9, right at the beginning. We find that our dear Mr.Pope, Sierra Clubs' former director, proudly announces that their favorite sugar daddy is none other than the infamous Mr. George Sorros, a major Illuminati king pin! The only thing green about Sorros is his green spineless slimy ulterior motives. He funds a few good causes like Sierra Club and Climate Change politicos, like Clintons and John Kerry who use same bait and switch tactics as most of us all know by now hopefully. Primary goal: the proliferation of war for oil and worldwide fraking for profit and power. Fraking with such a horrific track record ~ even with residual product of "clean" natural gas, so not worth the pay off! So not worth consequences of shifting earth crust resulting in countless related earthquakes, fouled and toxic land and water ways from leaking pipelines all over the world! We can so easily and economically get plenty of clean, natural methane gas from human made landfills! Cherry on top... Mr.Bloomberg still on board with thinking "clean" nuclear power plants are just ducky too! Ugh!